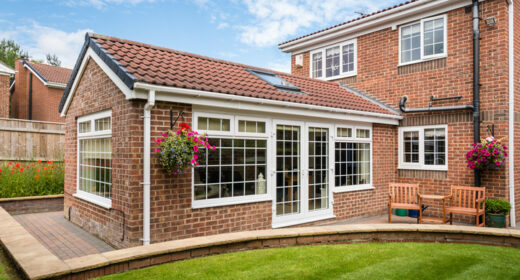 Extending your home is a popular way to increase space and add value to your property. With the hassle and costs of moving house – from legal fees to stamp duty – the reasons to stay put and improve your existing home soon mount up. But where do you start? Whether you’re thinking of a garage extension, side extension, double or single storey rear extension, there is much to consider as you embark on an improvement project to expand your home. To help get you started, we take it from the top with pointers on planning rules, building regulations, through to handling the neighbours and finding a builder. You can undertake some extension projects without the need for planning permission, referred to as your “permitted development rights”. Under the rules, a rear wall of a detached home can be extended by 8m to the rear if it is a single storey property, and 3m if it is double storey. This is reduced to 6m in a semi or terraced house. There are also height restrictions: a single storey extension not being higher than 4m in height to the ridge and the eaves, and ridge heights of any extension not being higher than the existing property. And double storey extensions mustn’t be closer than 7m to the rear boundary. There are other conditions that must be met. For example, if the extension is more than half the area of land around the original house, you will need planning permission. Extensions must be built with similar materials to the existing property. Find out whether or not plans fall under the permitted development guidelines. Different planning rules may also apply if your home is in a Conservation Area, and for any renovations to a Listed Property you will need to obtain listed building consent. Regardless of whether or not planning permission is required, any renovation project must comply with building regulations. You’ll need to ensure whoever carries out the work can either self-certify the work they do (for example, FENSA accredited window fitters, Gas Safe registered gas engineers and NICEIC registered electricians and so on) or will liaise with the local Building Control Officers at your council to have their work certified. If the requirements aren’t met, you could be served with a notice to take the extension down and will have trouble when it comes to selling your home without the relevant Building Regulations certificates. Read more in our guide Do I need Building Regulations approval? Before starting the project it’s important that you contact your home and contents insurance provider to let them know of your plans. The extension will likely increase the rebuild cost of your house – which insurers take into account when pricing premiums – while any building work could put the property at risk of damage. If you don’t let your insurer know and there’s a problem with the property at some point you may find your policy is void. Your insurer will let you know if your current policy will cover the new extension. You may find your premiums increase. If for some reason they are unable to cover the property now you’ll need to find a new provider before your cover is cancelled. You should also check that any builder working on your property has professional indemnity insurance to cover the costs should something go wrong. Building projects can be a major cause of disputes between neighbours. If planning permission is required, your neighbours will be consulted by the local planning authority, but before a letter lands on their mat, it’s a good idea to let them know about your plans well in advance, particularly if the works may cause disruption. A party wall is the shared wall, usually between a terrace or semi-detached house, and divides the homes of two separate owners. It also includes garden walls built over a boundary and excavations close to a neighbour’s property (within three or six meters, depending on the depth of the new foundations). Party Wall Agreements between neighbours are most commonly needed for loft conversions and extensions which require the insertion of steel supports, a damp proof course and/or digging of new foundations. Depending on the scale of the project, you may wish to involve an architect. There’s no law saying you need to use an architect, even for large renovations and builds, but some people find it easier to have a professional draw up the designs. Using an architect will generally mean you’ll get a better end result, however their fees are usually around 15%, so you’ll need to factor this into your budget. When you meet your architect, it’s important you give as much detail as possible on what you want from the project, your timings, how and when you intend to pay them and what penalties will be in place if deadlines are missed. The architect will then send you a detailed appointment letter along with a contract to sign. A structural engineer can also provide technical drawings and calculations which can be used to seek Building Regulation approval and will then be used by your building contractor and/or architect during the renovation work. The key to any successful home improvement project are professional, reliable tradesmen. Online review sites are a good place to start when comparing builders and other contractors. We’ve partnered with Checkatrade because of their user-friendly approach. When setting a budget for your job start by making a list of everything you would like included (bear in mind the cost of a two story extension is not that different to a single story structure as most of the cost is in the foundations). Compare your quotes item by item and when pricing services and materials always check the VAT is included in the costs. We’d also recommend setting aside around 10% of the total cost for unexpected additional costs. How do I work with an architect? Very nice site and very well written. Thanks for sharing.